In today’s world of political correctness, how would an Asian artist translate his own historical lineage into a piece of multi-cultural multi-disciplinary art form worthy of commanding the world’s attention? For Singaporean Jailani Zai Kuning, his “Dapunta Hyang: Transmission of Knowledge” embraces his Bugis Malay lineage as the Riau Archipelago’s traditional warriors after researching pre-Islamic history and the voyages of conqueror Dapunta Hyang Sri Jayanasa, the 1st Malay king of the 7th century Srivijayan Empire that had dominated the Malay Archipelago from the 8th to the 12th centuries. 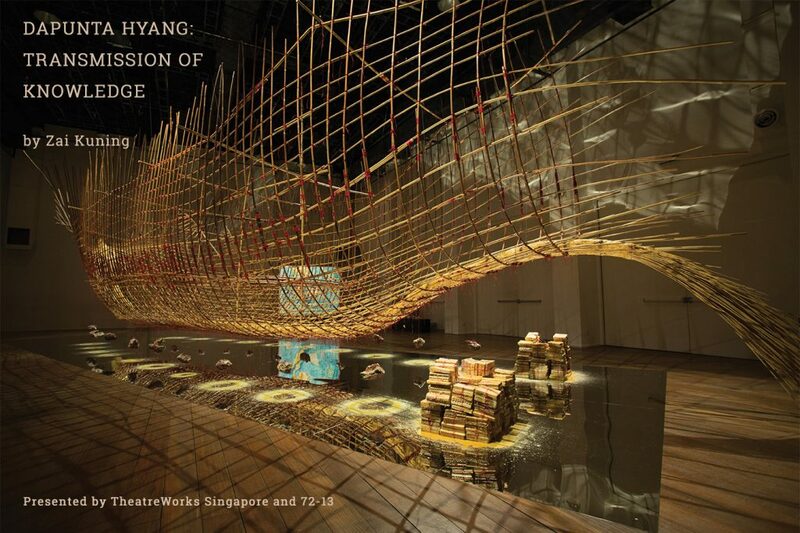 The resulting arresting installation is a suspended 17-metre long imagined vessel that Dapunta Hyang had steered; magically emerging from the depths of the ocean floor to unload mysterious books upon books sealed with beeswax – all silently witnessed by portraits of ancient Malay opera performers, the Mak Yong. Currently roosting in Singapore at 72-13 Mohamed Sultan Road, after its recent participation in the 57th Venice Biennale in 2017, the artwork offers insight into an almost 20-year long journey Zai has taken with the orang laut – the sea gypsies – and the Mak Yong performers in his search for the lost world of the Malay kingdom. Using only rattan, waxed thread and wax to fashion the skeleton-like ship with clusters of red-thread-tied pebbles hanging off its lower parts, it fleshes out Zai’s obsession with meta-historical questions of “Who am I? Where do I come from? Whom do I belong to? Whom do I answer to?” in relation to the Malays’ ethno-genesis and migration. Central to Zai’s quest is the affirmation that Dapunta Hyang, as a Malay Buddhist, helped spread Buddhism throughout his kingdom. “Dapunta Hyang had an army of 20,000 that ventured on [the] sacred journey Siddhayatra; crossing the Straits of Malacca towards the South China Sea, to promote Buddhism and acquire blessings. This first Malay king was building Buddhist stupas wherever he set foot,” shared Zai. Theatre Works thus promotes this exceptional work as an impetus of the urgency to “resurface questions on how knowledge has been transmitted, manipulated and directed across time and space to inform us of our present realities”. While Zai’s intentions, along with Theatre Works’, are noble, its shortcomings are apparent in his narrowed focus on only the positives of Dapunta Hyang’s accomplishments. Dapunta Hyang’s role as conqueror received but a fleeting mention. Yet the 7th century CE series of Srivijayan inscriptions – the “Siddhayayra inscriptions” – and the 683 CE dated Kedukan Bukit inscriptions place as much emphasis on the Srivijayan empire he had established via his conquests of neighbouring enemies in Riau in Jambi, Palembang, Southern Lampung and Bangka island, over which he reigned from 671 to 702 CE; along with the military campaign he had launched against Bhumi Java that had probably contributed to the decline of the Tarumanagara kingdom in West Java. Are we not airbrushing the realities of that era? Airbrushing away the truth that humanity of all forms and cultures’ inhumane disregard of others not belonging to one’s own backyard to further one’s own selfish interests was once the global norm? Perhaps it is time to look beyond being politically correct by looking at history in its totality to gain a balanced view of those times. As we cannot blame all Germans for what the Nazis did in Europe nor blame all Japanese for what its government and army did in Asia concurrently, let us just name and shame the individuals who were directly responsible for the injustices done to specific individuals during World War II and during the eras where conquests of all sorts – big and small – were the global norm. And let these be the basis for all descendants of the conquered since the beginning of time to forgive, forget, heal and move on. 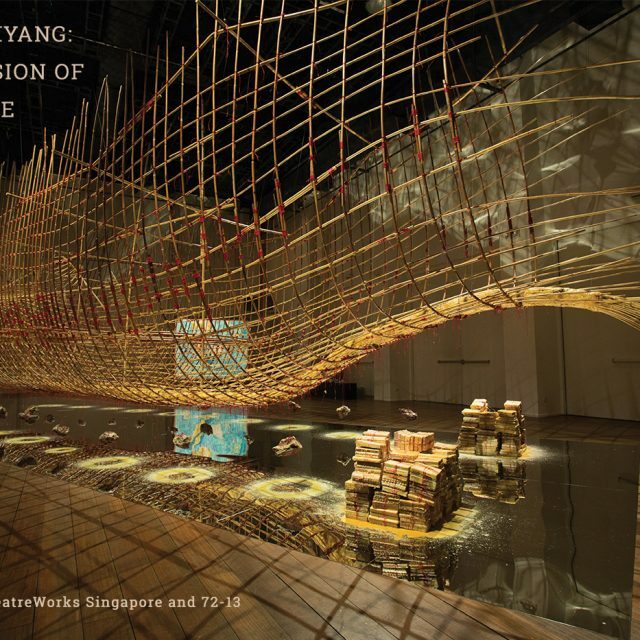 Jailani Zai Kuning’s “Dapunta Hyang: Transmission Of Knowledge” is on display till 13 May at 72-13 Mohamed Sultan Road, Singapore 239007. To gain further insight on the research that culminated in Zai’s “Dapunta Hyang” installation, view his “Dupunta Mapping the Melayu” and other drawings on the Orang Laut and normadic indigenous fishermen living in the Riau Archipelago on show till 2 June at Ota Fine Arts, 7 Lock Road, #02-13, Gillman Barracks, Singapore 108935.